In the private world of the gardener's imagination there exist certain flowers that have entwined themselves in our past. We associate them with happy memories of childhood, with family celebrations, and with traditions. Lilacs, most certainly, are a part of many of our fragrant dreams, whether we have actually grown them or not. Extensive cultivation and hybridization of more than 30 known lilac species have led to 2,000 varieties blooming from as early as the second week of May through mid-June. Syringa vulgaris, the common lilac, is the oldest lilac in cultivation and was brought to this country from Europe before 1700 by the earliest settlers. Hybridization of this species and the introduction of new varieties became a seemingly endless endeavor. Some of the best hybrids were introduced by Monsieur Victor Lemoine of Nancy, France, in the 1800s. His nursery developed the French lilacs with extremely fragrant double blossoms. Isabella Preston introduced many of the later-blooming varieties, primarily in the pink and lavender shades. And it was Father John L. Fiala who was responsible for bringing 78 new cultivars to the public before his death in 1990, including many of the blue-flowering types. Lilacs demand full sun and good air circulation, especially to keep powdery mildew from forming on their leaves. A neutral, fairly alkaline soil composted with plenty of organic material is necessary for good growth. After their first few years of regular watering, lilacs become quite drought tolerant. They are heavy feeders and appreciate an application of 10-10-10 granular fertilizer once in early spring and then again after they flower. Failure to bloom can be the result of failure to fertilize. The modern cultivars, including the dwarf introductions, generally require a light pruning for shape after the plant flowers. Old, overgrown lilacs, particularly the common lilac cultivars, benefit from renovation pruning where one-third of the oldest canes are cut to the ground, taking care to leave the main trunk or stem. This process is repeated over a few years until all the oldest canes are removed. All lilacs will produce more flowers the following year if their flower heads (and developing seeds) are promptly pruned off as they begin to dry up. 'Monroe' BLUE SKIES®, developed by the Monrovia Nursery, has pale-blue fragrant blossoms that emerge from rosy violet buds. 'Little Boy Blue' is a dwarf form that bears abundant sky-blue fragrant blooms in spring. 'Mme. Lemoine' was named in honor of the wife of the foremost lilac breeder of the nineteenth century, and has double, pure-white, fragrant flowers that bloom in midspring. 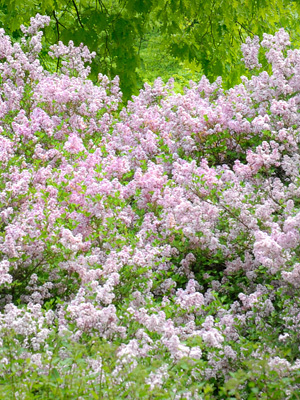 The Meyer lilac has many attributes that make it a good choice for gardens. It is mildew resistant, produces many flowers, and has an ornamental, rounded habit less than half the size of the common lilac. Its flowers are violet to purple, with a strong fragrance. 'Palibin' is the dwarf form of the Meyer lilac. Its compact, 5-foot habit, numerous pink to lavender flowers, and mildew resistance make it a fine selection for smaller gardens. Often touted as a plant with three seasons of interest, this lilac features very fragrant violet to purple blooms, an upright form that can extend to 9 feet, and foliage that turns from dark green in summer to reddish purple in fall. 'Miss Kim' is the dwarf form of the Manchurian lilac. It grows from 4 to 6 feet and features clove-scented, light blue flowers and good fall color in its foliage. These fast-growing lilacs were developed in Canada and bloom two weeks later than the common lilac in tones of purple, pink, and white. Most of the cultivars grow to a rounded form between 5 and 8 feet. 'Hiawatha' features bright green foliage with pale pink blooms. This lilac is a true tree reaching 25 to 30 feet with an upright oval habit. The attractive bark is a glossy, dark reddish-brown, resembling cherry tree bark. This is the last lilac to bloom, starting in June, with large, fragrant, creamy white panicles. Two cultivars listed below, known as Peking lilacs, were released through the Chicagoland Grows® program in which the Garden participates. 'Morton' CHINA SNOW® features abundant fragrant white blooms and exfoliating amber-colored bark for winter interest. 'Zhang Zhiming' BEIJING GOLD™ produces unusual yellow blooms and its foliage turns golden in the fall. Lilacs have such memorable attributes — their distinctive, heart-shaped leaves, their classic flower clusters, and their unforgettable fragrance. What would Mother's Day or Memorial Day be without masses of lilacs?